Hello everyone, this will be my first article for Gecko Time. 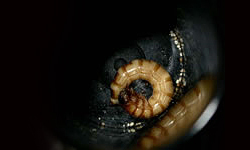 My name is Gonçalo Pereira and I am the owner of the DartGeckos project, from Portugal. 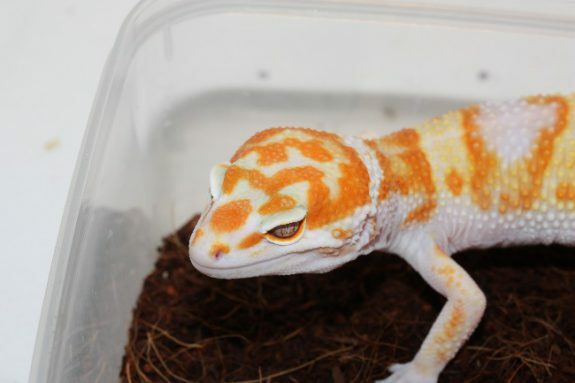 DartGeckos is a hobby that I have had since 2010 when I bought my first leopard gecko, a High Yellow morph. I never planned to have leopard geckos. Back in 2010 I started to research information on how to maintain and breed poison dart frogs, I have always been fascinated by amphibians but it was very difficult to get information from any source other than the internet and also there was no equipment nor animals to buy in Portugal at that time. Later in 2010 I had a chance to get an adult leopard gecko from a seller that wanted to get rid of his collection and since I had read that a leopard gecko was a good pet and easy one for beginners I decided to take my chances and I bought it. I still have my first leopard gecko who is now 7 years old (he was already 1 year old when I got him!). 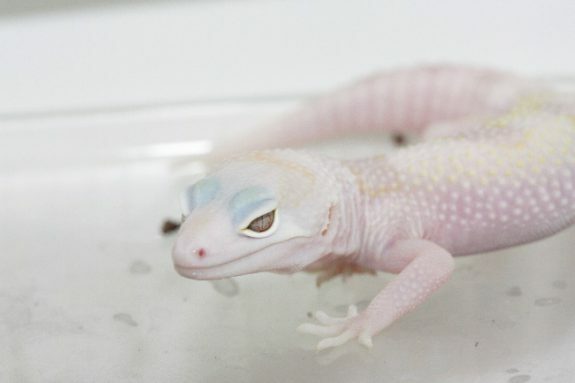 When I got my first leopard gecko I saw how amazing these pets are and started to dig into more and more information on morphs, breeding and genetics. After two years I decided to start building a nice collection and planned to breed them later on. The first season I bred leopard geckos I only got eggs from one female and that female only laid 2 fertile eggs. I thought it was fine, it was just for me to start getting the feel of what is it to breed reptiles. Then, in 2013 I decided to build my own project. The name was a problem since I couldn’t think of a nice name that could be easily memorized and then I tried a lot of logos to give a professional look to the project but I never found one that was what I was looking for. 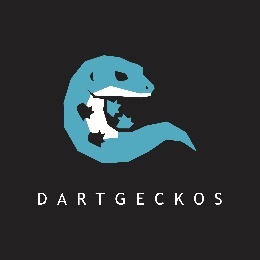 After some attempts, I decided to ask a friend of mine, Ricardo Leitão, and the previous owner of Puzzle Reptiles to design me a logo for my project and that is the current logo of DartGeckos. My main goal in this project is to selectively breed leopard geckos and poison dart frogs. Basically, it is my attempt to have high-quality animals and no less than that. 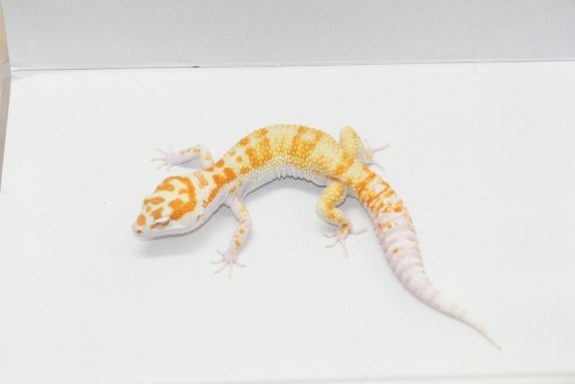 I started to breed leopard geckos back in 2013 after getting my first White & Yellow Tremper Albino from JPReptiles’ fire albino line. It was a genetic combination I really appreciated and I wanted to work on it so thanks to Fran Lhotka from Coolizard.com I had a chance to get a male from that line later in 2012. In my first season I tried to replicate the genetics of that W&Y Tremper but I didn’t get any W&Y from that first pairing. I had just a few hatchlings from a giant pairing and some APTORs and Trempers from that male W&Y. Those hatchlings from the W&Y pairings produced some skinny geckos that developed too slowly and I noticed I had to outcross that line sooner or later to get a heathy outcome so I bought from Ultimate Geckos a het free Afghan Tangerine pairing which I would use later to outcross the W&Y Tremper line when I get the first W&Ys from the original male. In 2014 I got my first W&Y Tremper Albino, a healthy female with an amazing coloration; no doubt the W&Y gene was present. Since 2014 I have been trying to get strong and amazing W&Y Tremper Albinos. Currently I have banded and striped ones and some non-W&Ys that have that orange coloration. Back in 2014 I hatched a gecko that ended up with a similar coloration as W&Ys but I know it doesn’t have the W&Y gene. This is my third year breeding this genetic combination and while there are some similar colors between W&Y Tremper Albino and some of my non-W&Ys their color develops distinctly. I can get into this theme in depth in another article if I get a chance. 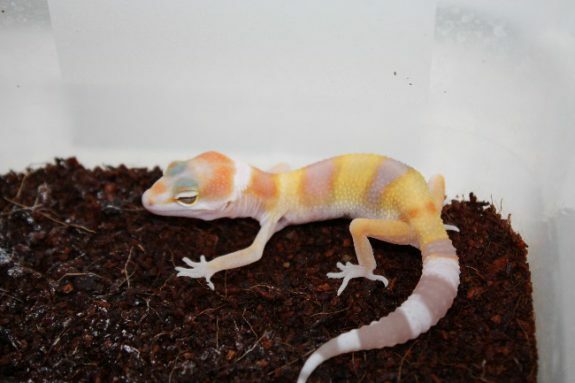 The next photos will show my current W&Y Tremper Albino and non-W&Y. Besides from W&Y Tremper Albino project I work with a het free Mack Snow bold project, some Afghan Tangerines and recently I have introduced the Mack Snow gene into the W&Y Tremper Albinos, getting my first ever W&Y Mack Snow Tremper Albino this past 2016 season. Leopard geckos have been bred in Portugal for many years. One of the most prestigious breeders is Puzzle Reptiles who are known for Bold Bandits and have the best Bold Bandit Tremper Albinos I have seen so far. Some of my first breeders are from their bloodlines and many Portuguese breeders have at least one or two animals from them. As the years were passing various people came with different gecko projects and now I can say we have a bunch of breeders here in Portugal but we have a big problem that comes with it. 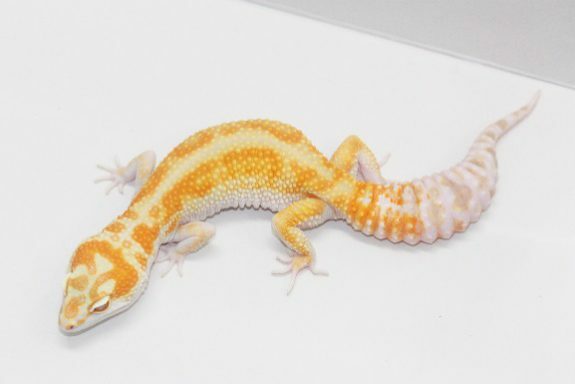 Since we are in an unfavorable zone of the Europe, we have difficulty selling our geckos and as everyone knows from a perfect beautiful pair not 100% of the hatchlings will look as spectacular as their parents but we can’t keep them all. Basically, we can ship geckos here in the country or to our neighbor Spain and that’s it. We can´t reach any other country from here, to reach other countries we have to drive a lot of kilometers to shows mainly Hamm Terraristika but it’s not that viable to constantly do it. Right now we have a big problem because we have many breeders and a lot of geckos available through the year but the demand is constantly decreasing each year. It is not that common to see a bunch of leopard geckos in pet shops here in Portugal. Reptiles in shops are still a bit of a tragic scene as most shops don’t know the basics about them. One of the most frequent mistakes is the lack of humid hides for leopard geckos, which is a key factor for them to be healthy. 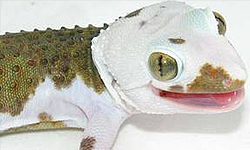 Although there are some pet shops that have one or two geckos to sell, they sell them for such a high price and low quality that I really can’t say they compete with private breeders but they sure take some deals because some people don’t look for professional breeders and just go to shops and buy. I hope you enjoyed this brief history and actual scene of leopard geckos here in Portugal. I want to thank everyone that keeps supporting our project and we are doing our best to give the best geckos each season. If you are interested in updates from our projects check out our availables at www.dartgeckos.com, like our page at facebook.com/dartgeckos and follow us on Instagram – dartgeckos. Gonçalo is a histology technician with a masters degree in molecular biology and since his youth has demonstrated interest in herpetology. He started this project when researching the possibilities of maintaining captive bred poison dart frogs in Portugal. Gonçalo has another interest and that is drawing as he tries to develop his skills in his free time. Beautiful W&Y project. I like hearing about what’s going on in other countries with reptiles, especially what morphs are considered up and coming and what breeders are working on in various locales. Somewhat similar situation is here in Greece, my country. 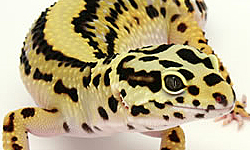 Many breeders and dwindling recipients because many of the people wanting a leopard gecko have it already. Few pet stores have reptiles, and they are mostly unhealthy and overpriced. But there are some excellent stores. From one of them I have my hypo female. The good think about here is that the Hamm show is nearer and so breeders with particularly special or many animals can and do travel there.